The Nuclear Physics group has received a one year $1.6 Million grant from the National Science Foundation for continuing research and development of the first US based underground accelerator laboratory, the Dual Ion Accelerator for Nuclear Astrophysics, DIANA. This grant will allow the group to finalize the design and provide a budget baseline for the final NSF decision on funding and construction of the facility. Notre Dame is the lead institution of the DIANA project; other participating institutions are Lawrence Berkeley National Laboratory, The Colorado School of Mines, Michigan State University, the University of North Carolina, and Western Michigan University. 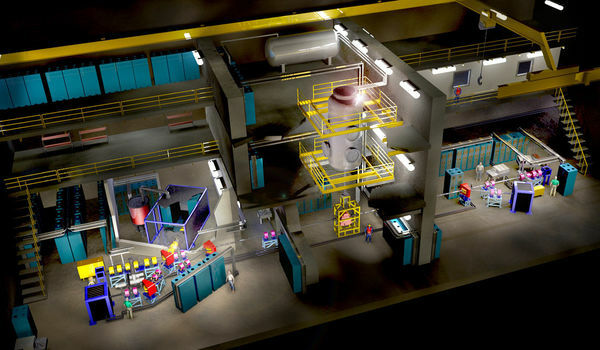 The figure shows an artist conception of the facility as presently planned, consisting of two high intensity low energy accelerators. The low energy machine is a Cockroft Walton type providing milli-Ampere beams up to 400keV and the second one machine is a vertical Pelletron type accelerator generating beams with energies up to 3MeV. Originally published by Shelly Goethals at physics.nd.edu on August 27, 2012.